Per-user - Power BI Pro licensing and free licensing. A Power BI Pro license enables access to all content and capabilities in the Power BI service, including the ability to share content and collaborate with other Pro users. Only Pro users can publish to and consume content from app workspaces, share dashboards, and subscribe to dashboards and reports. A free license enables access to some of the features of the Power BI service. For more information, see Per-user license type comparison. Capacity-based - Power BI Premium licensing. Premium provides dedicated capacity to deliver more consistent performance and support larger data volumes in Power BI. For individual users, Premium also enables widespread distribution of content by Pro users without requiring Pro licenses for recipients who view the content. For more information, see What is Power BI Premium?. This article focuses on per-user licensing from an administrator perspective. As an administrator, you can purchase and assign Power BI Pro licenses; and you can sign up for a Power BI Pro trial for your organization. Individuals can also sign up for a Power BI Pro trial. You purchase Power BI Pro licenses through Microsoft Office 365 or through a certified Microsoft partner. After you purchase the licenses, you assign them to individual users. For more information, see Purchase and assign Power BI Pro licenses. There is a grace period after a Power BI Pro license expires. For licenses that are part of a volume license purchase, the grace period is 90 days. If you purchased the license directly, the grace period is 30 days. Power BI Pro has the same subscription lifecycle as Office 365. For more information, see What happens to my data and access when my Office 365 for business subscription ends?. Individuals in your organization can sign up for a Power BI Pro trial. For more information, see Signing up for Power BI as an individual. Users who take advantage of the in-product Power BI Pro trial do not appear in the Microsoft 365 admin center as Power BI Pro Trial users (they appear as Power BI free users). They do, however, show up as Power BI Pro Trial users in the manage storage page in Power BI. If you want to acquire and deploy Power BI trial licenses to multiple users in your organization without users accepting trial terms individually, sign up for a Power BI Pro trial for your organization. To sign up, you must be a member of the Global administrator or Billing administrator role in Office 365. There is a limit of one organizational trial per tenant. This means that if someone has already applied the Power BI Pro Trial to your tenant, you cannot do it again. If you need assistance with this, contact Office 365 Billing support. Navigate to the Microsoft 365 admin center. On the left navigation pane, select Billing then Subscriptions. On the right side, select Add subscriptions. Under Other Plans, hover over the ellipsis (. . .) for Power BI Pro and select Start free trial. On the order confirmation screen, select Try now. On the order receipt, select Continue. Now you can assign licenses in Office 365. You can assign a Power BI license to them within the Microsoft 365 admin center. 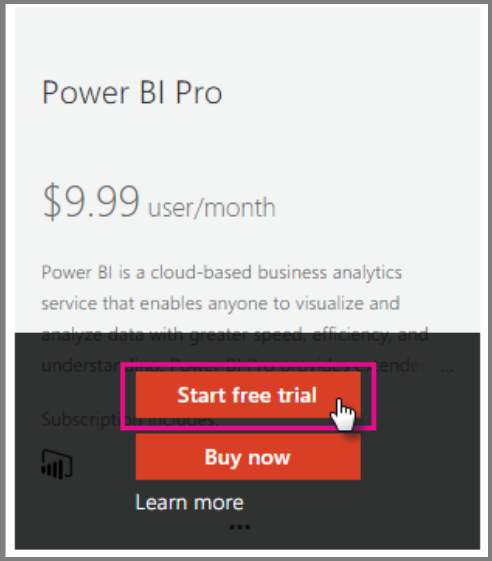 If a user signs up for a Power BI Pro trial and the trial expires, they are assigned a free license. If you plan to manage license requests and assignments centrally, first check whether you already have the unlimited Power BI (free) license block. This block of licenses is available after the first time someone signs up for Power BI as an individual. During that process, this license block is attached to your organization, and a license is assigned to the user who is signing up. In the Microsoft 365 admin center, under Billing > Licenses, check for unlimited. Have a member of your organization sign up individually, which triggers the creation of the unlimited block. Go to the next procedure, where you can sign up for a fixed number of licenses. If the unlimited Power BI (free) license block isn't available and you don't want to do an individual sign up, follow this procedure. 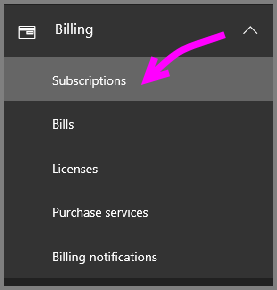 On the left navigation pane, select Billing > Subscriptions. On the right side, select Add subscriptions +. Under Other Plans, hover over the ellipsis (. 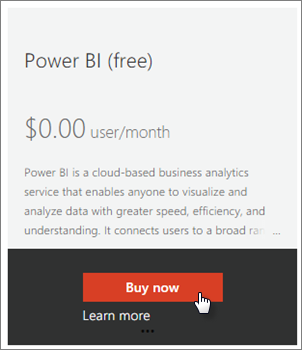 . .) for Power BI (free) and select Buy now. Enter the number of licenses you want to add and select Check out now or Add to cart. Enter the required information in the check out flow. There is no purchase when using this approach, although you will need to either enter your credit card information for billing, or choose to be invoiced. You can now assign licenses in Office 365. 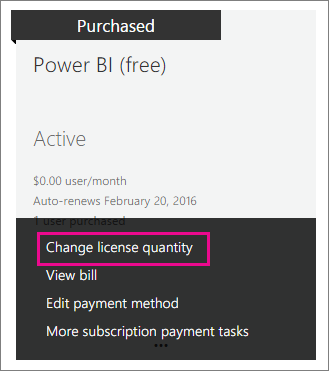 If you decide later that you want to add more licenses, you can go back to Add subscriptions, and select Change license quantity for Power BI (free). As an administrator, you can choose to enable or disable individual user sign ups through Azure Active Directory (AAD). 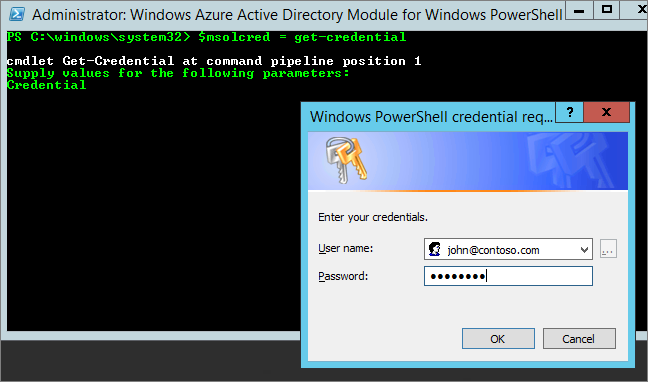 This section of the article shows you how to manage sign ups with PowerShell commands. For more information about Azure PowerShell, see Overview of Azure PowerShell. The AAD setting that controls sign up is AllowAdHocSubscriptions. In most tenants, this is set to true, which means it is enabled. If you acquired Power BI through a partner, this might be set to false, which means it is disabled. If you change the setting from true to false, new users in your organization are blocked from signing up individually. Users that signed up for Power BI prior to the setting change retain their licenses. Sign into Azure Active Directory using your Office 365 credentials. The first line of the following PowerShell script prompts you for your credentials. The second line connects to Azure Active Directory. Once you are signed in, run the following command to see how your tenant is currently configured. Run the following command to enable ($true) or disable ($false) AllowAdHocSubscriptions. The AllowAdHocSubscriptions flag is used to control several user capabilities in your organization, including the ability for users to sign up for the Azure Rights Management Service. Changing this flag affects all of these capabilities.